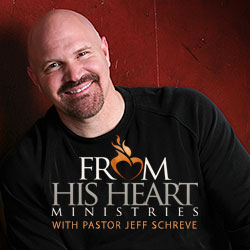 From His Heart Ministries is the multimedia broadcast ministry of Dr. Jeff Schreve. We exist to proclaim real truth and real hope from the loving heart of God to the lost and hurting in order to lead them into a personal relationship with Jesus Christ. We believe that no matter how badly you may have messed up in life, God still loves you and still has a wonderful plan for you. We desire to help people discover God’s amazing grace by preaching His Word without compromise or apology. Listen and subscribe now to the best Christian podcasts today from podcasters just like From His Heart Ministries. These popular Christian podcasts are available to listen to and download for free on Faithplay. Faithplay is filled with more episodes from From His Heart Ministries and other top Christian podcasts. Download Faithplay today and start listening!